Following its opening in the US earlier this year, sci-fi thriller 'Gravity' posted a record high box office taking for October. Finally, it appears that audiences are responding to the tremendous talent of filmmaker Alfonso Cuaron, who returned with his latest film five years after the incredible dystopian drama 'Children Of Men'. Critics lapped up his return but does 'Gravity' truly live up to the hype? As much as I found myself gripped through much of 'Gravity', I'd argue that this isn't a career peak for Cuaron, whose varied career has taken in 2001's indie darling 'Y Tu Mama Tambien' and 'Harry Potter And The Prisoner Of Azkaban' (2006). Perhaps it will be in terms of more mainstream success, with Oscar glory seemingly awaiting in at least a selection of technical categories and at least a nomination for Best Director, but less so in terms of delivering an entirely fulfilling and resonant film. 'Gravity' takes place in the vast emptiness of space - except we soon discover that space isn't so empty after all. George Clooney and Sandra Bullock star as astronauts who find themselves caught in a debris field that destroys their space shuttle, leaving them as the sole survivors. The nature of their orbit means that Clooney and Bullock will again be hit by the ever-expanding debris field, their survival becoming a race against time, not just as the debris looms once more, but also with their depleting oxygen and battery stores. 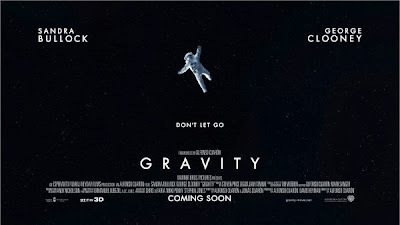 Cuaron (who also co-wrote the film with his son, Jonas Cuaron) crafts the scenario magnificently, and thanks to the cinematography of Emmanuel Lubezki and the stunning effects, 'Gravity' is a wide-eyed visual spectacle. Even the 3D works impressively well, immersing the viewer into the experience - although for a better taste of this, watch the 'Hubble 3D' and 'Space Station 3D' documentaries at an IMAX cinema. 'Gravity' unfortunately falls down on the emotional side - we are given little reason to care about the survival of the central characters outside of a feeling of obligation. The occasional touching moment does appear, delivered competently by Clooney and Bullock, but these come across as slightly forced. The lean running time of ninety minutes perhaps sacrifices some of the character development for tension, although this does mean that you may well find yourself clinging to the edge of your seat right to the very last minute. 'Gravity' is released in UK cinemas today, through Warner Bros.